A decorative glass door can really exemplify the beauty of your home. It allows more light into your home, is a ornamental first impression into your home, and provides you with that extra bit of style to make you a proud home-owner. Your Door Our Glass is proud to provide you with a decorative glass door to spice up your home. Maintaining the glass to ensure that it is always at optimum cleanliness may seem like a daunting task, especially if your kids like to smear their fingerprints on the door or your pet gets a little too close to it. However, in this blog, we’re going to explore some simple tips to cleaning and maintaining the pristine beauty of your new glass door. When your glass door is first installed, the initial glow is an aesthetic you want to keep. Our detain in the form of art is in itself a very unique design to have on your door, so showcasing its beauty is definitely something you want to shine. With proper care, you can keep the glow staying for years to come. To help maintain the glow of your glass door, it’s recommended to clean it regularly and to be sure to not mix glass cleaning solutions as it can cause damage to your door and reduce its effectiveness. Though it may seem like an easy and effective way to clean your glass door from the outside, the pressure from the water can have negative implications for your glass doors. It can wear away at the seal that protects your glass door from the outside temperatures. Your glass door’s exposure to the outside can have a tendency to collect quite a bit of dust and dirt. Dust can accumulate from the door’s constant exposure to the outside world, as the sun shines through, dust can settle on the intricate and beautiful designs on your door. Before applying a glass cleaning solution, use a cloth (with no metallic fibers) with some soap and water to wipe away the dust. Choosing a cleaning solution that works best for you is subjective, but regardless of which you choose, ensure to follow up the dirt and dust clean up with the application of glass cleaning solutions. The smudge that comes from your kids fingerprints or your dog glaring into the outside world can be quite an eye sore, but after cleaning, it will make your decorative glass door look as good as new. It is important to note that you should ensure to clean both sides of your doors, not just the interior or the exterior alone. 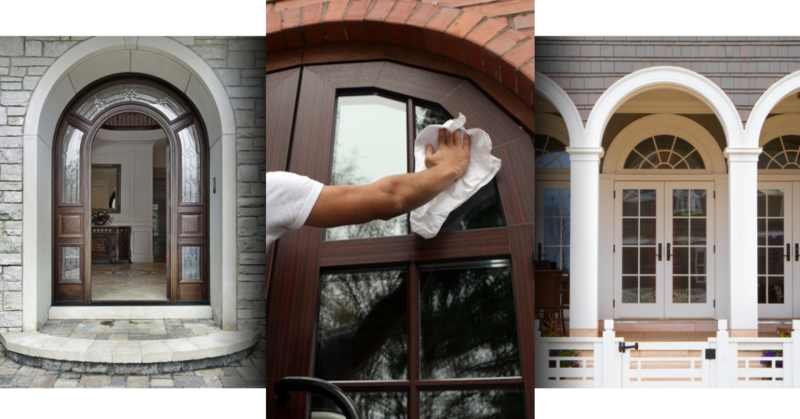 Maintaining both is vital to ensuring that your glass door is clean and the unique decor shines bright. If you’re looking for your front door to get an upgrade, look no further. At Your Door Our Glass, we can work with your existing front door structure to create a glass door that is decorative and an exciting addition to your home. To learn more, view our website or contact us today!